The Woodstock Byrdcliffe Guild’s 17th Annual 5 by 7 Show launches Friday, December 2, with a catered champagne reception and preview party at the Kleinert/James Center for the Arts from 5:00 to 7:00 pm, one of the most exciting art events happening in Woodstock each holiday season. All work submitted is restricted to 5 inches by 7 inches in size and is exhibited anonymously, a playful way to give an equal voice to all and showcase the talent of our members side by side with that of the international art world community in our midst. This is a major fundraising event for Byrdcliffe, and by contributing and/or purchasing a small work you will help support our arts programming, including exhibitions and performances. 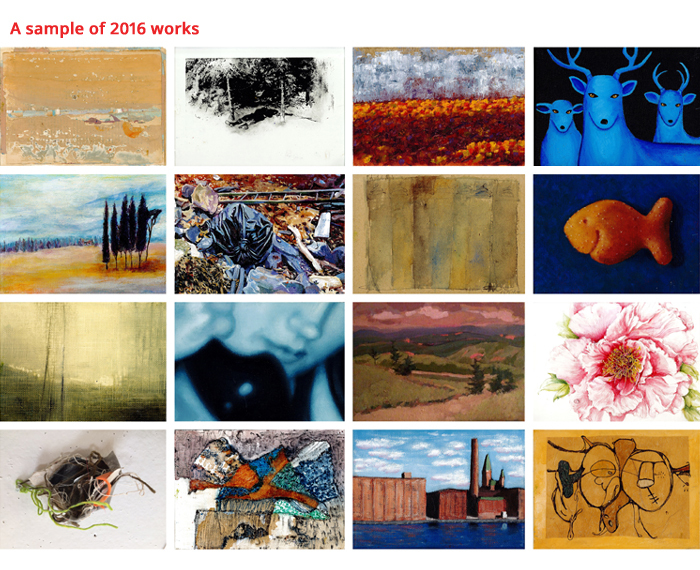 The 2016 Annual 5 by 7 Show is proudly sponsored by ARTSYSTEMS and Karen and Les Walker. The food at the Preview Party will this year be provided by Provisions from Woodstock. Left: Gaze, 2016. 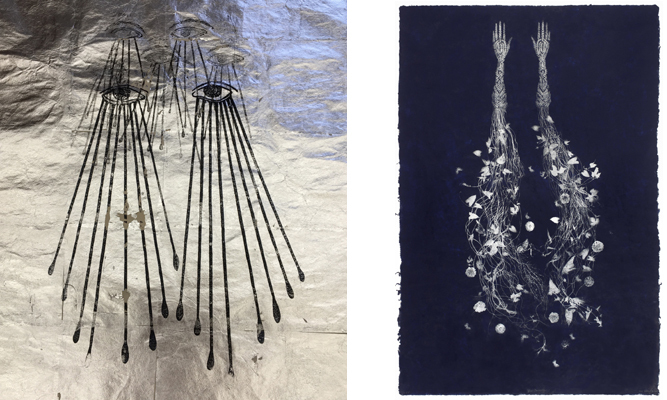 Relief print with silver leaf on Gampi paper, 38 x 25 inches // right: Blue Anemone, 2011. Relief printed lithograph on handmade Kozo paper, 72 x 48 inches. 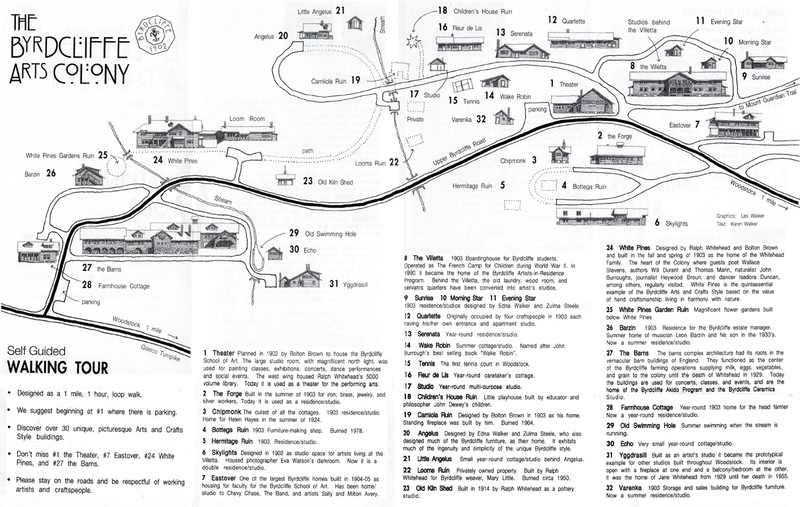 An important force in the Arts and Crafts movement in America, with a rich artistic and social legacy, the Byrdcliffe Arts Colony supported self-sufficiency, fulfillment in work and the preservation of local crafts. Opposed to industrial manufacturing, its mission focused on producing beautiful objects in a variety of art forms made by hand using time-honored techniques. Curated by Sylvia Leonard Wolf, Tina Bromberg and Karen Walker. Meet the lenders: Saturday, August 20, 3:00 pm. Informal discussion with collectors and lenders to the exhibition; learn what the artworks in the Byrdcliffe’s Legacy exhibition mean to them, from their personal relationships with the artists to how the artworks came into their lives. Closing Talks: Saturday, October 8, 3:00 pm – on this penultimate day of the exhibition, gallery visitors will join an informal discussion with collectors and lenders to the exhibition — learn what the artworks in the Byrdcliffe’s Legacy exhibition mean to them, from their personal relationships with the artists to how the artworks came into their lives. Followed by a free concert for Byrdcliffe and Maverick members with Nancy Allen Lundy, soprano, and Douglas Jay Martin, piano, and the closing reception. Left: Petra Cabot (1907-2006), TEXTILE DESIGN, c. 1928. Gouache. 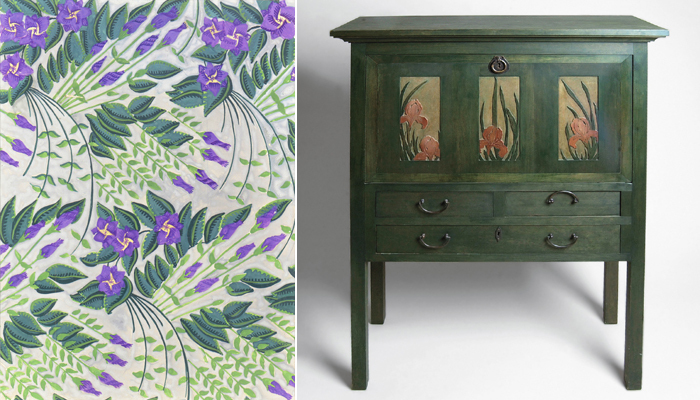 10 x 7 1/2 inches // right: Zulma Steele, Drop-Front Desk with Three Iris Panels, 1904. Cherry wood, stain. 50 3/8 x 38 3/4 x 16 inches. Photo Matthew Ferrari. Left: Director’s Chair, 2015. 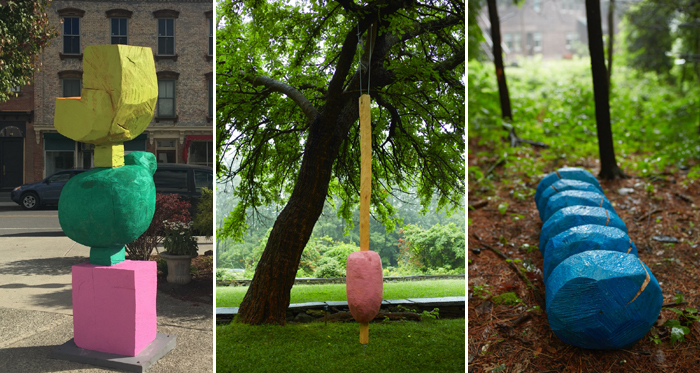 Stained white pine, 98″ x 28″ x 30″ // middle: Big Pink, 2016. Stained wood, 132″ x 17″ x 17″ // right: Blue Cloud, 2016. Stained wood, 12″ x 39″ x 12″. Margaret Cogswell, Ashokan Fugues, 2014. 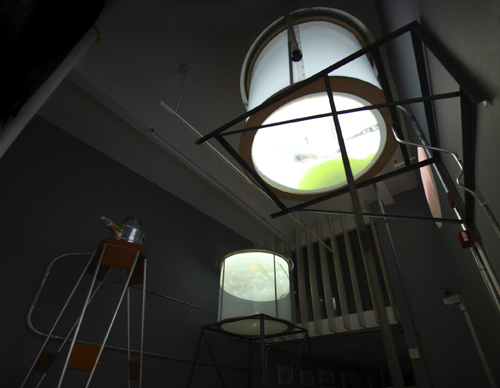 Installation at the CUE Art Foundation, New York City. Mark Loete. Left: Red Fox; right: Black Nose Dace. Archival prints, 16 x 20 inches. Courtesy of the artist and the Phoenicia Library. Read an article online in the Hudson Valley Almanac about the Shimmering Substance exhibit and Keiko Sono’s project! Left: Robert The, Brook, 2004. Old encyclopedia set, dimensions variable // middle: David Nyzio, Smoke Flow #6, 2011. Smoke on paper, 60” x 40” // right: Tricia Cline, Knowing’s Wife, 2015. Porcelain, 17″ x 11″ x 8″. The Woodstock Byrdcliffe Guild invites all Byrdcliffe members to participate in its 2016 Annual Members’ Show, called “UNUM SUMUS“. The show is open to all current members. A “Curator’s Choice” award in the amount of $100 will be presented for one work chosen by the Exhibition Committee. Curated by the Byrdcliffe Exhibition Committee. All 2016 Byrdcliffe arts programming is made possible by the New York State Council on the Arts with the support of Governor Andrew Cuomo and the New York State Legislature.